Easter Monday was a bit of a wash out. We stayed in and played more games and chilled. 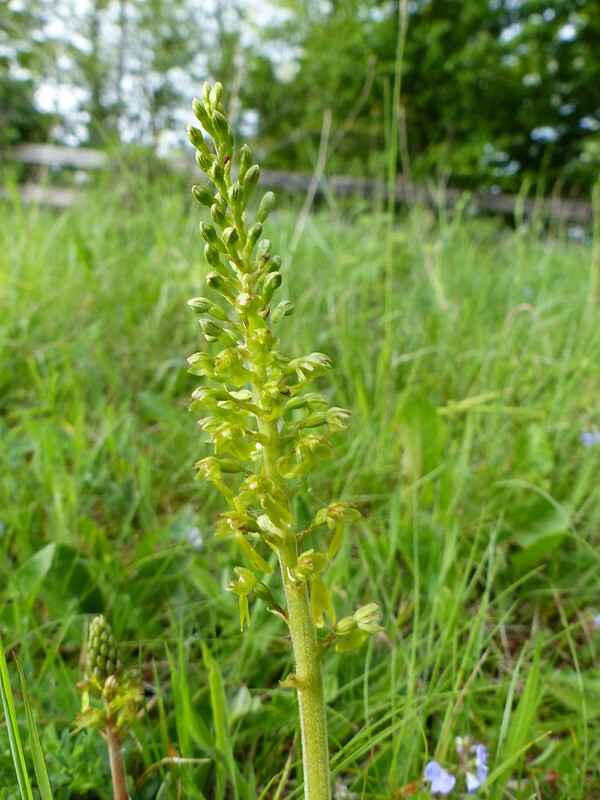 Eventually, when the rain paused briefly, Andy and I set out on a wander around Eaves Wood. Of course, the weather had just been lulling us into a false sense of security and it was soon drizzling, and then chucking it down again. 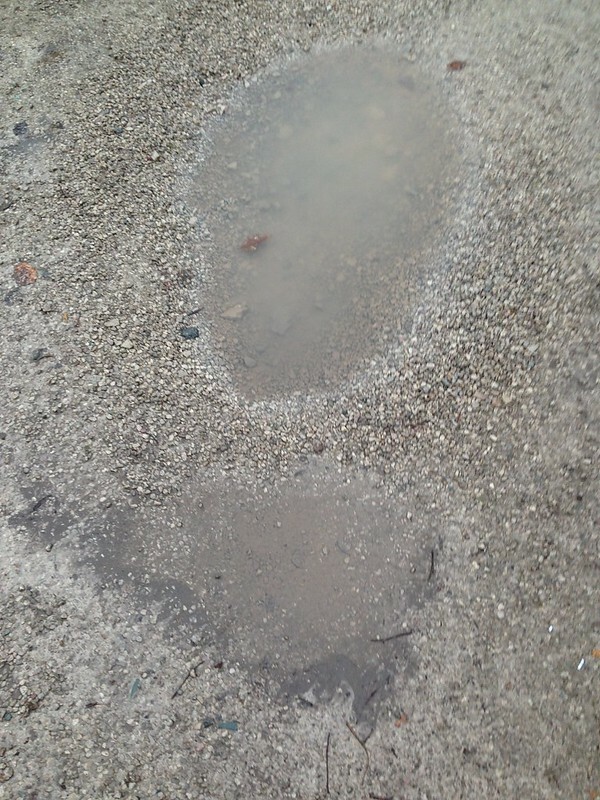 Everywhere was clarted up with mud again and, almost inevitably, one of my slips led to a proper both-feet-in-the-air-arse-in-the-mud pratfall. By that time I think we were both already considering giving up and heading home, but that banished any doubts and we made a beeline for dry clothes and hot tea with me looking and feeling like Swamp Thing. The Tuesday was forecast to start in much the same way, but then brighten up. We’d already arranged to meet The Tower Captain and his daughter S for a walk; the Surfnslide crew decided that they would stay another day to squeeze in one more walk and catch up with TTC. I didn’t fancy another walk in the rain (I’m not sure anyone else was all that keen either) so we elected to wait for the weather to improve before we set off. We were just finishing our lunchtime soup, watching it still rain through the kitchen windows, and cursing the forecasters, when the rain finally stopped, right on queue. 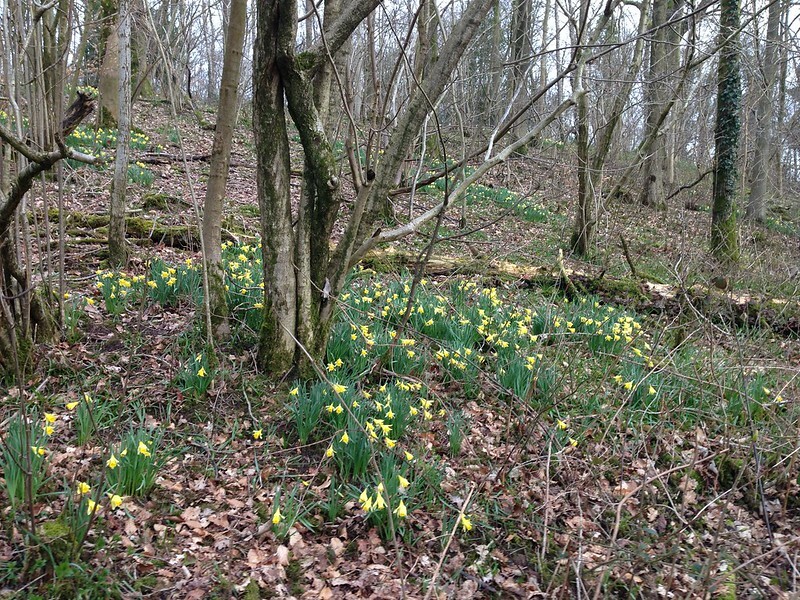 We left a car at the southern end of Brigsteer Woods, piled into the other two cars and parked those in the smaller of the two car parks on the Underbarrow – Kendal road. That car park is in a small, old quarry. 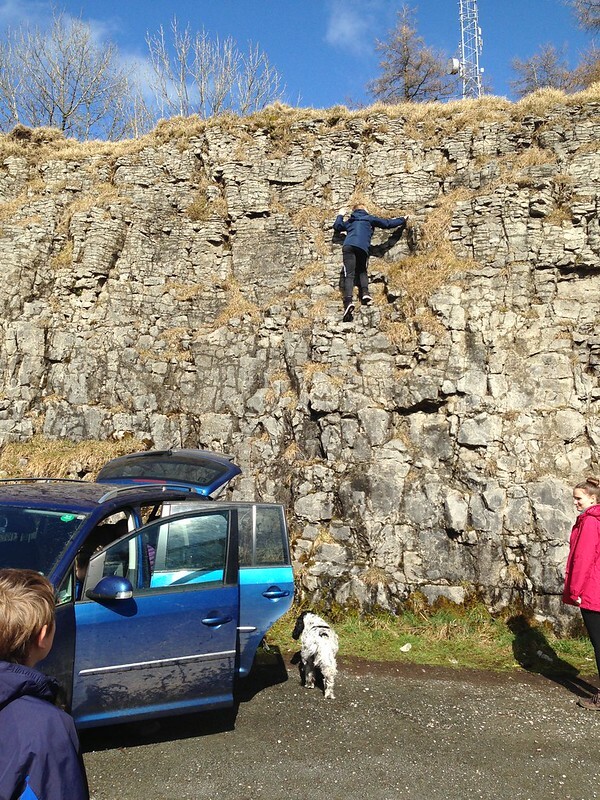 Almost inevitably, the DBs saw this as a brilliant opportunity to do some climbing and scare the wits out of the rest of us. 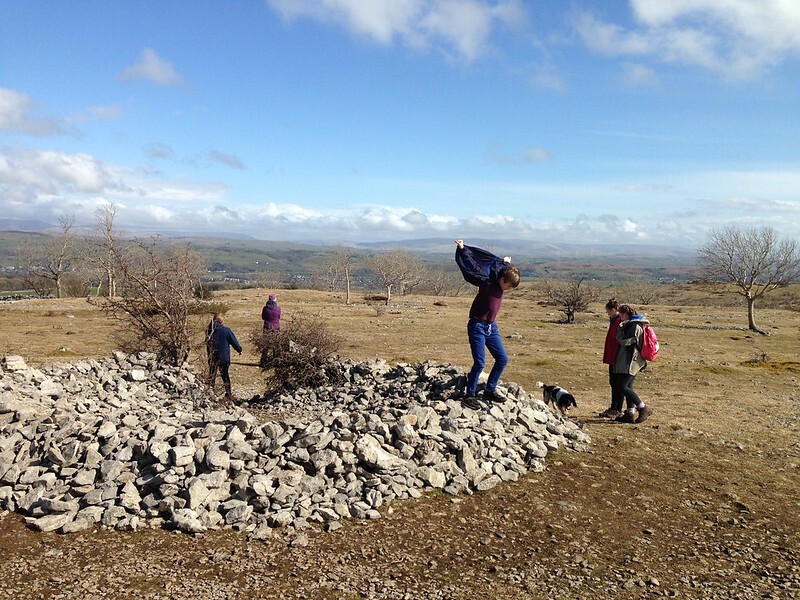 A very small climb soon brings you out on the highest part of Scout Scar, which has marvellous views of the higher hills of the lake District. We were a sociable group of ten, or twelve if you count TTC’s two dogs. 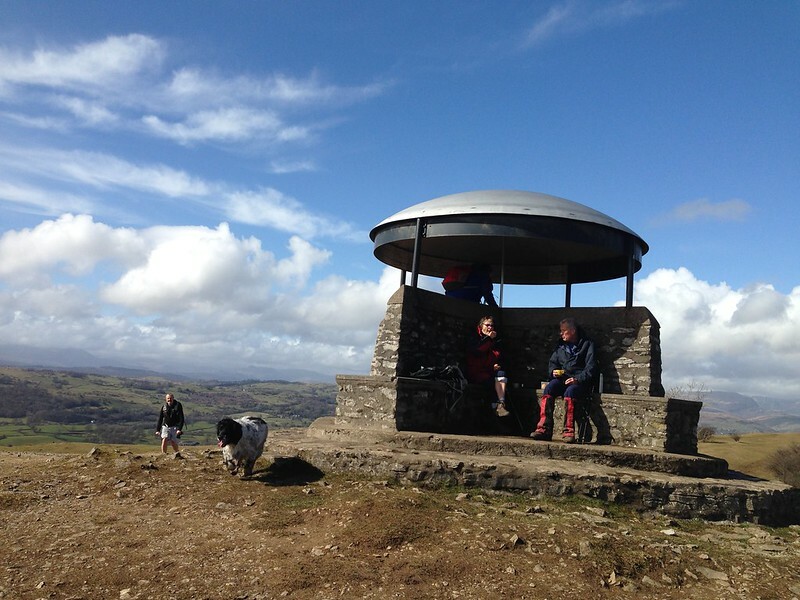 …is The Mushroom, a shelter built in 1912 to commemorate the Coronation of King George V. The inside of the rim of the roof has a pictorial topograph which picks out the many hills and places which can be seen from this relatively modest top. 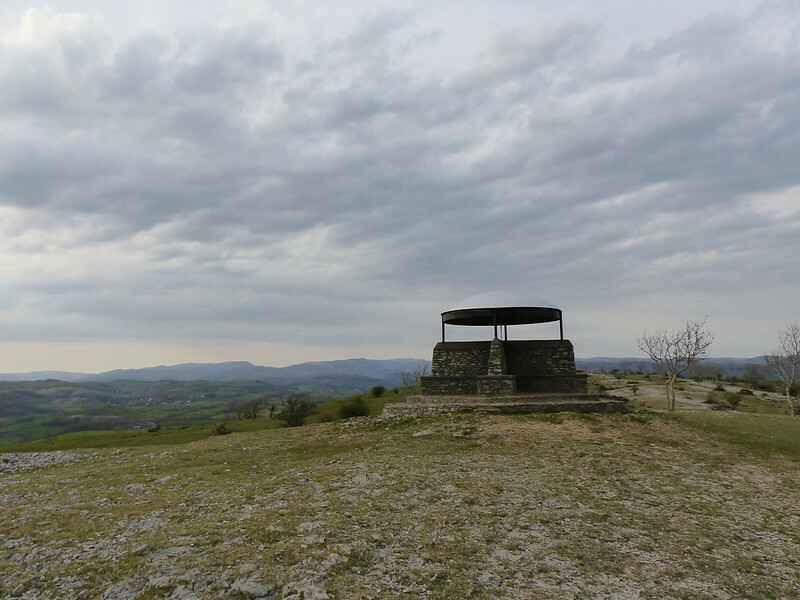 Scout Scar panoramas. Click on these, or any other photos, to see larger images on flickr. Almost inevitably (there’s a theme emerging here surely? 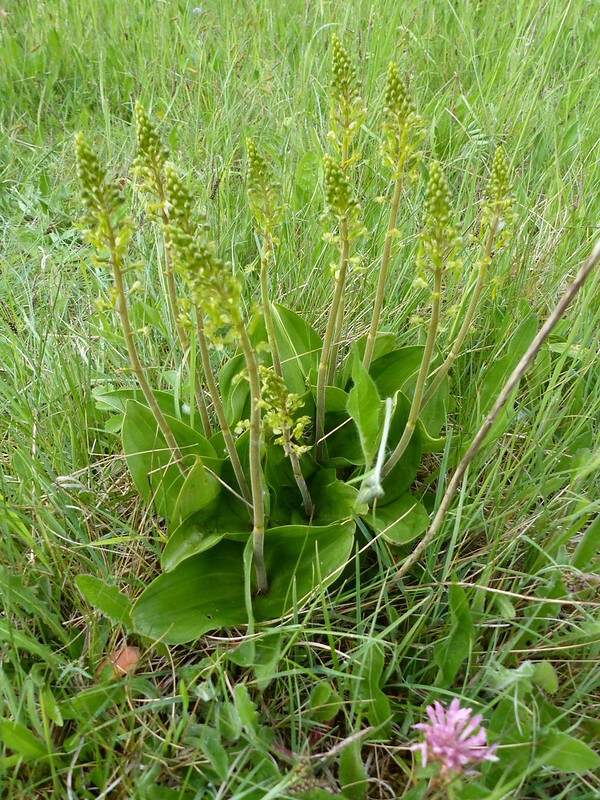 ), despite the sunshine, there was a cold wind blowing. Little S thought maybe he could use his coat to glide on it. 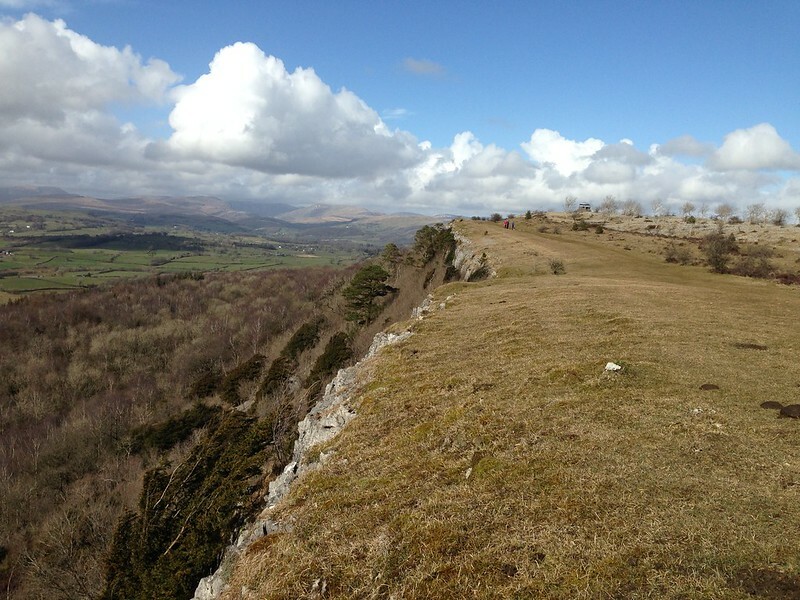 Unlike Whitbarrow, on Scout Scar there’s a path right along the edge. 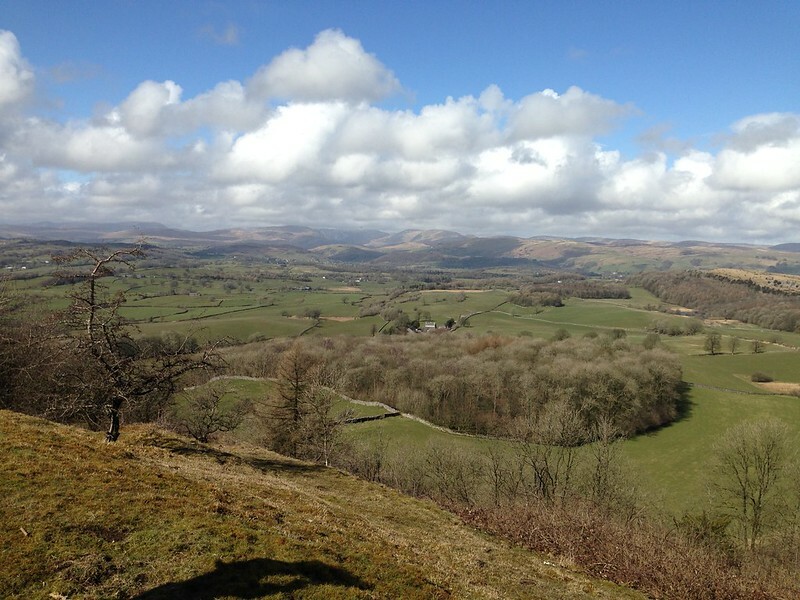 We were walking south, away from the Lakeland fells, but the temptation was always there to turn back to admire the view along the edge back to those hills. 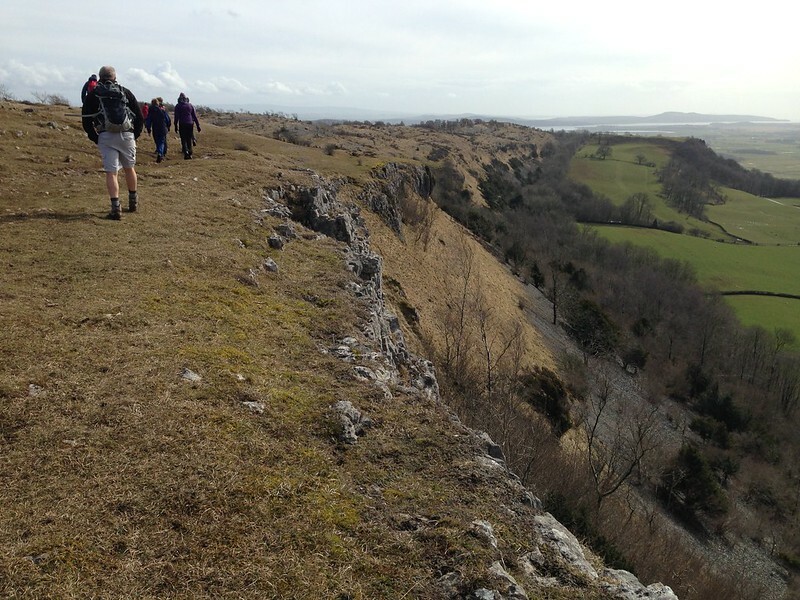 Scout Scar, Kent Estuary, Arnside Knott. 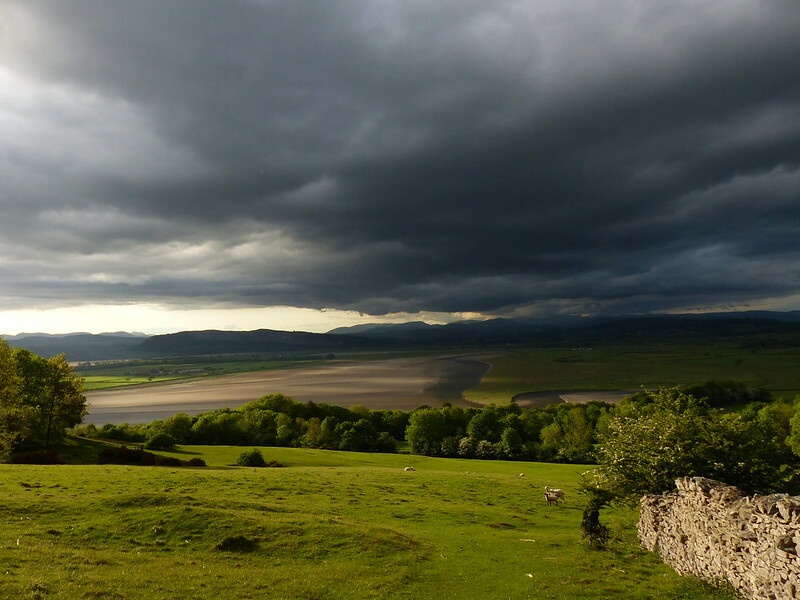 Arnside Knott, Lyth Valley, River Gilpin, Whitbarrow. Meadow Ant mounds in the foreground. The ‘new’ wetland at Park Moss. St. John’s Church, Helsington, built in 1726. 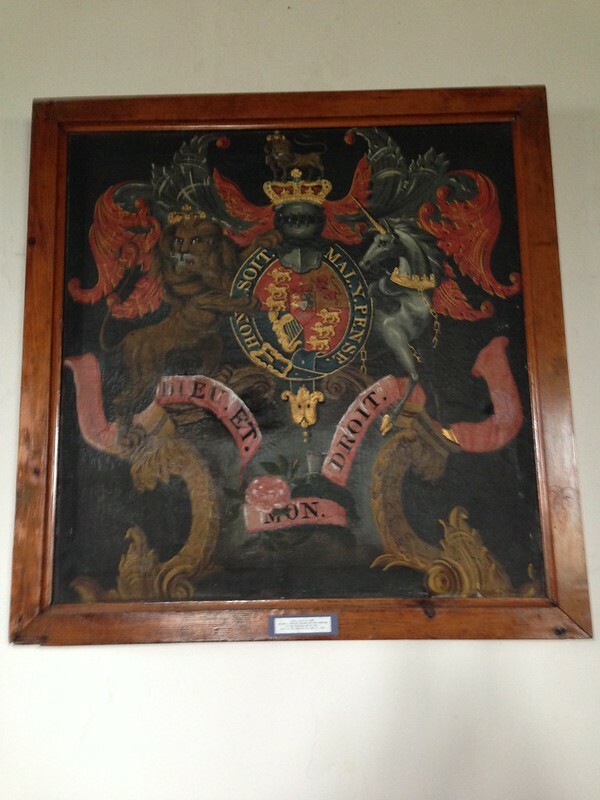 These painted Royal coats-of-arms are a feature of the small, rural churches in this area. 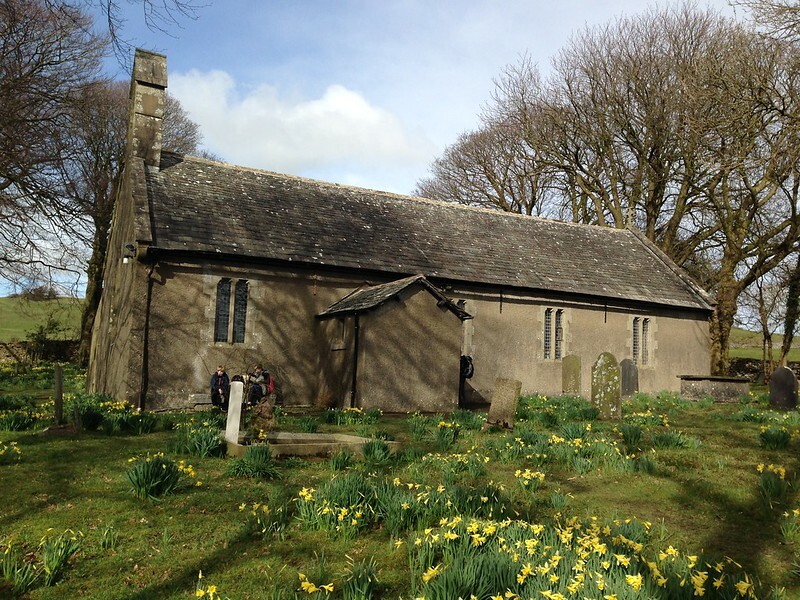 Both Witherslack Church and St. Anthony’s on Cartmell Fell have them too. This one is the coat-of-arms of King William IV, crowned in 1830. 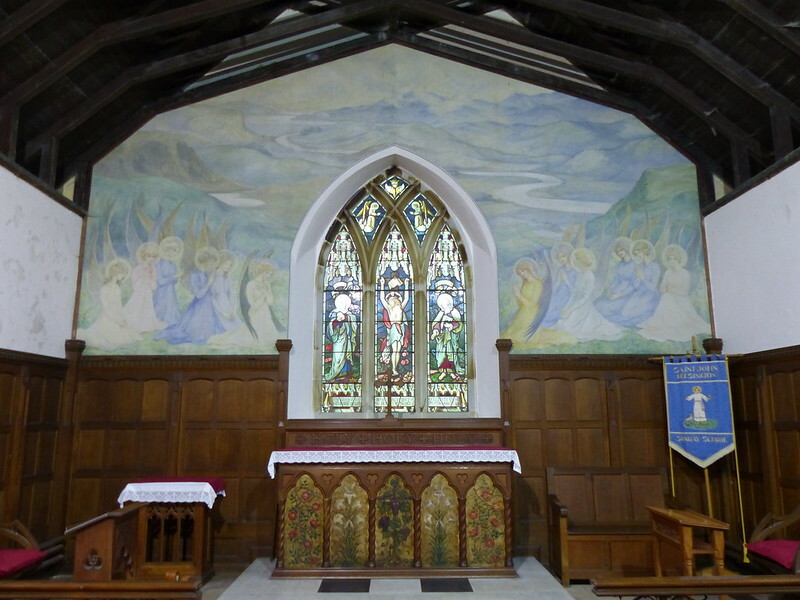 Mural, painted in 1919 by Miss Saumarez. 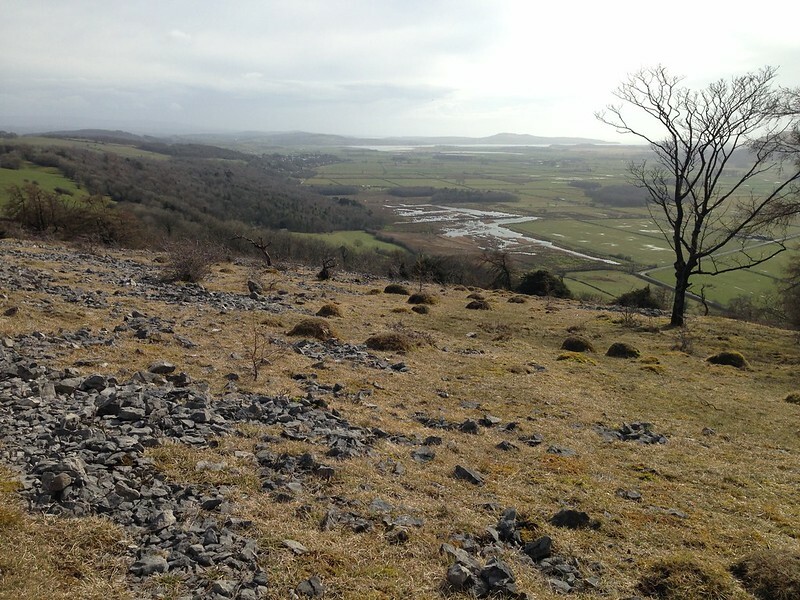 Park Moss and Whitbarrow Scar. 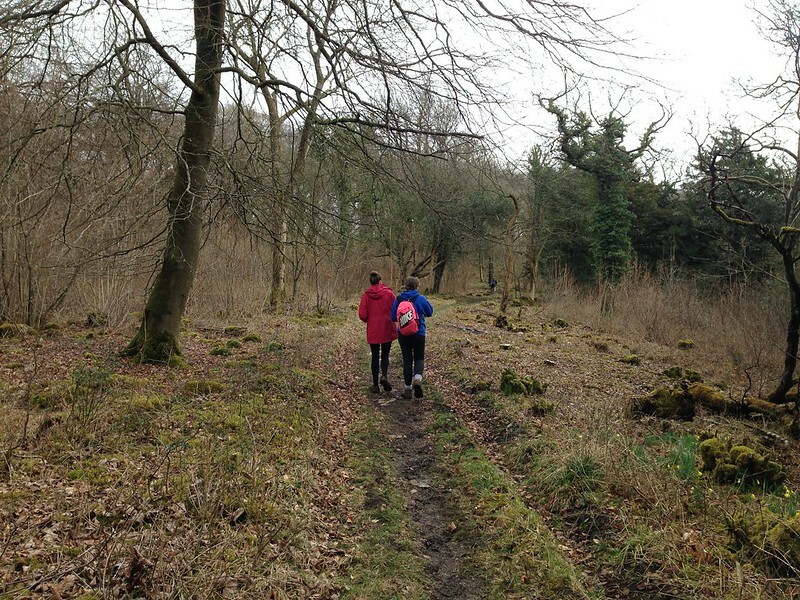 The paths through Brigsteer Woods were something of a quagmire, not surprisingly after a day and a half of rain. 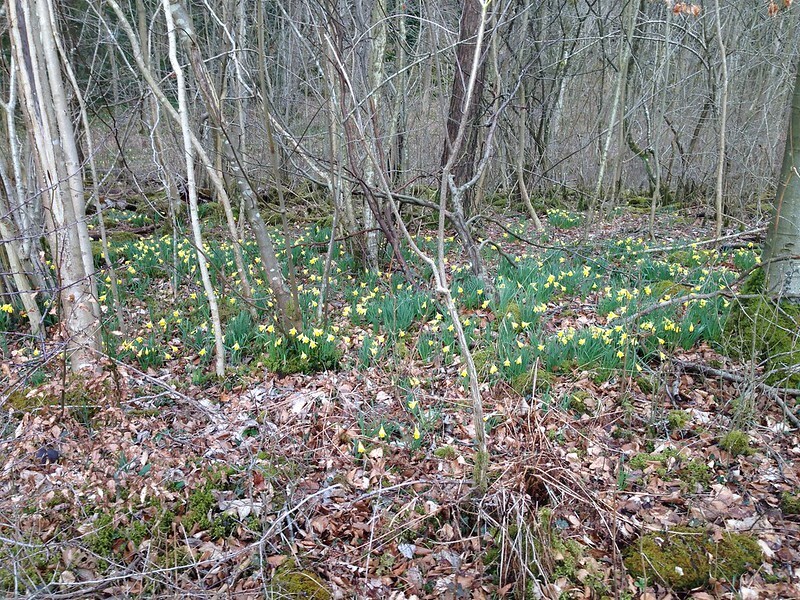 But there was some compensation in the form of the daffodils which fill some parts of these woods at this time of year. A short walk, but one packed with interest. 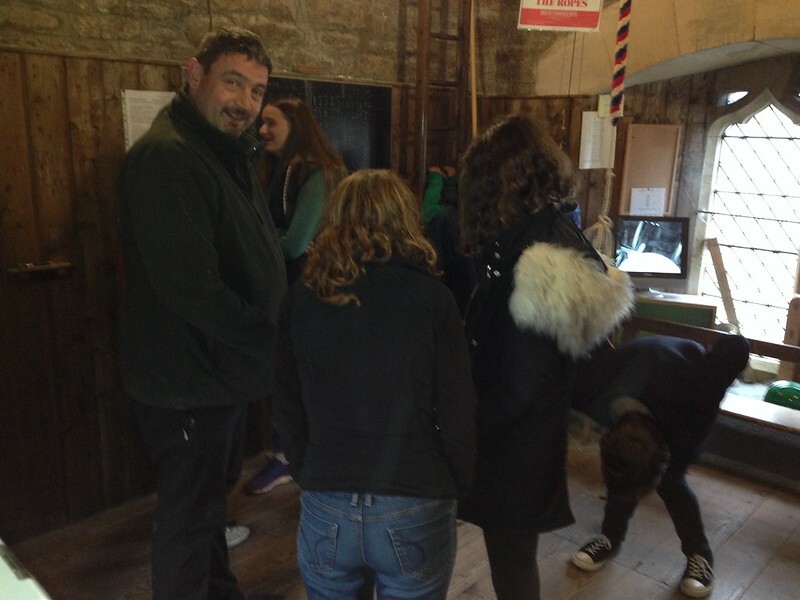 …but declined the rather spindly looking ladder and the balancing act around the bells above to get to the roof. The photos I took didn’t come out too well, but The Tower Captain really looks in his element here doesn’t he? 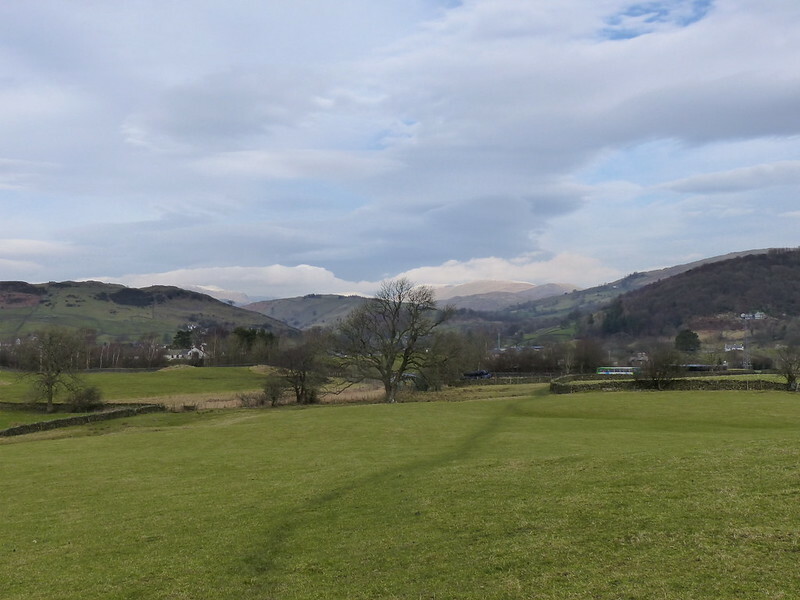 Just out of Staveley, looking back towards the Kentmere valley. 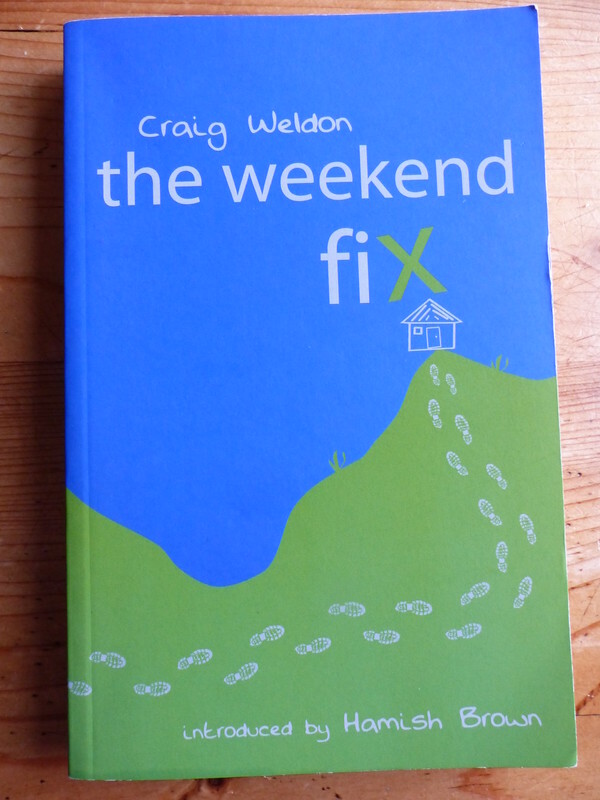 February half-term. TBH and the ankle-biters – I shall have to stop calling them the ankle-biters, they’ll soon be looking down on me and patting me condescendingly on the head – as I was saying, TBH and les enfants terrible were meeting some friends in Staveley to celebrate a birthday with a short stroll, a meal in the marvellous Wilf’s Cafe and a visit to Staveley’s well-appointed children’s playground (they aren’t so grown-up yet that they can’t appreciate swings and slides etc.). I suppose I could, perhaps should, have been sociable and joined the party, but this seemed like too good an opportunity to miss – a chance to walk point-to-point. 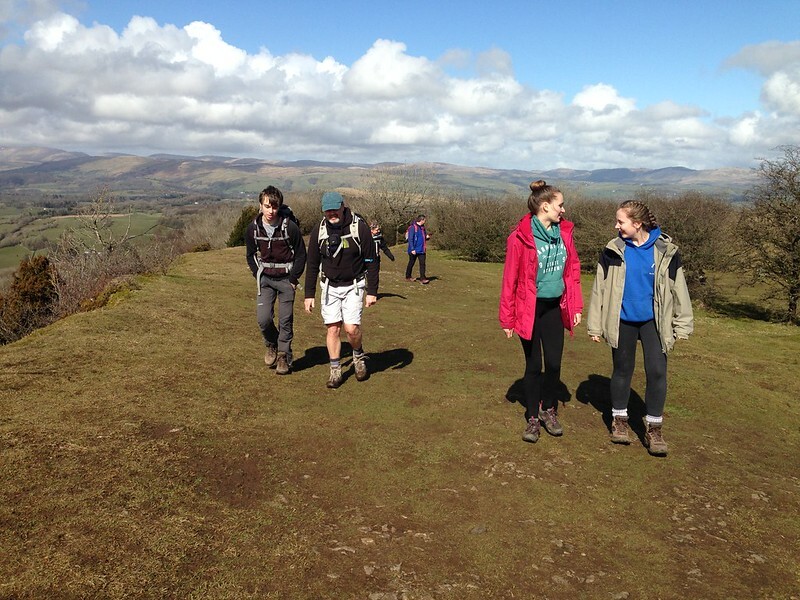 In particular, to walk the full length of Cunswick and Scout Scars. So that’s what I did. I’m still enjoying playing with the panorama function on my camera, even though the results are rarely what I hope for. If you click on the photo (or indeed any of them) you can see a bigger version on flickr. A scheduled nine o’clock meeting was hastily put back to ten after phone calls revealed that none of the invited parties were remotely ready for the off. We finally made it to Staveley shortly after eleven. Fortunately our friends are very understanding. And almost as bad at timekeeping as we are. 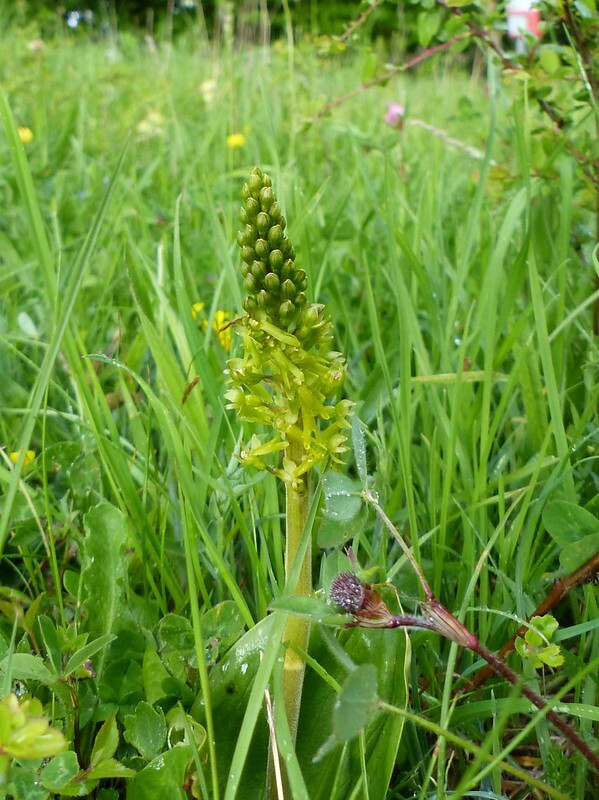 The weather started very promisingly, with one brief spell of quite warm sunshine. The walking was very pleasant, although progress was slow since there didn’t seem to be any paths heading quite where I wanted to go, necessitating some frantic zig-zagging. 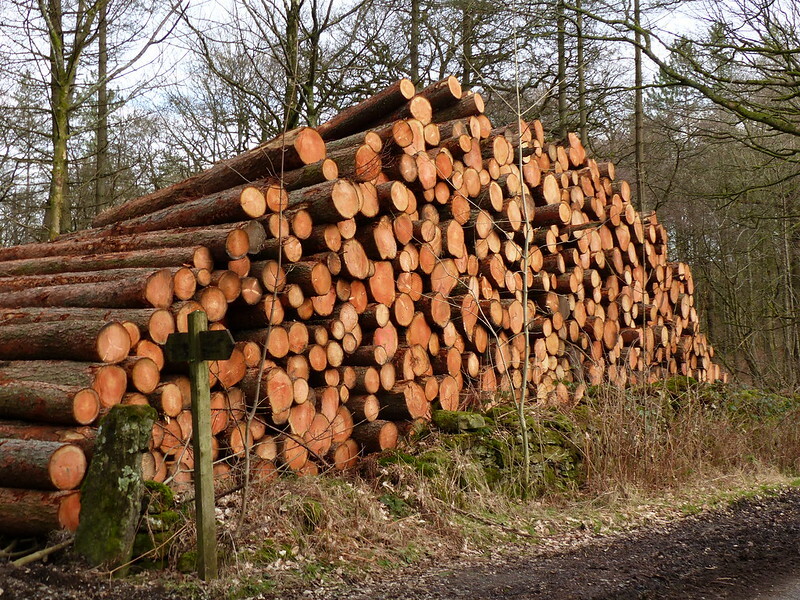 Tree-felling in the area around Ratherheath Tarn seemed to be targeting all of the non-native conifers, whilst leaving the rest of the woodland intact. 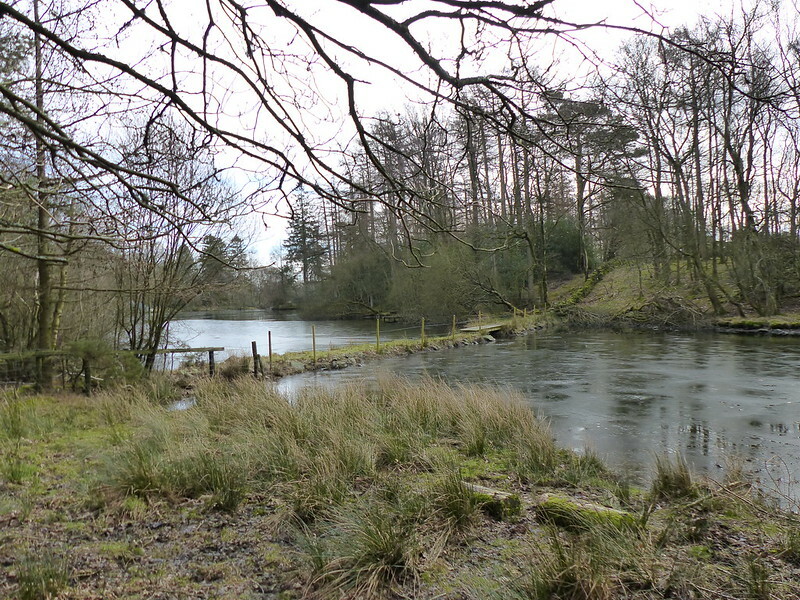 The tarn itself still held a thin skin of ice from that morning’s frost. 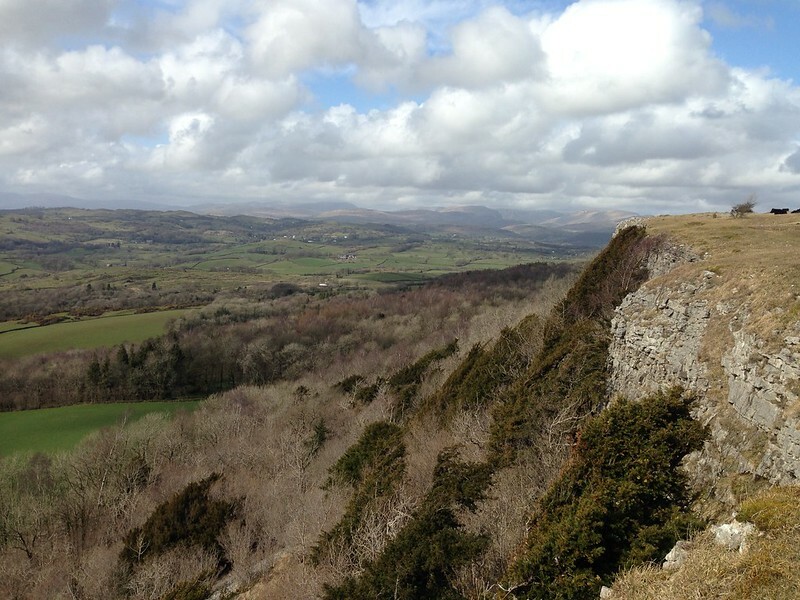 I can’t help feeling that if Cunswick Scar and its neighbour Scout Scar and, across the valley, Whitbarrow Scar were anywhere else in England than on the borders of the Lake District, then these long limestone escarpments would be far more famous than they are. Much as I enjoy a circular walk, or an elliptical walk, or any closed loop route, there’s something particularly satisfying about walking from A to B. A big part of the appeal are the views ahead to what’s to come and the views behind to what’s been and gone. 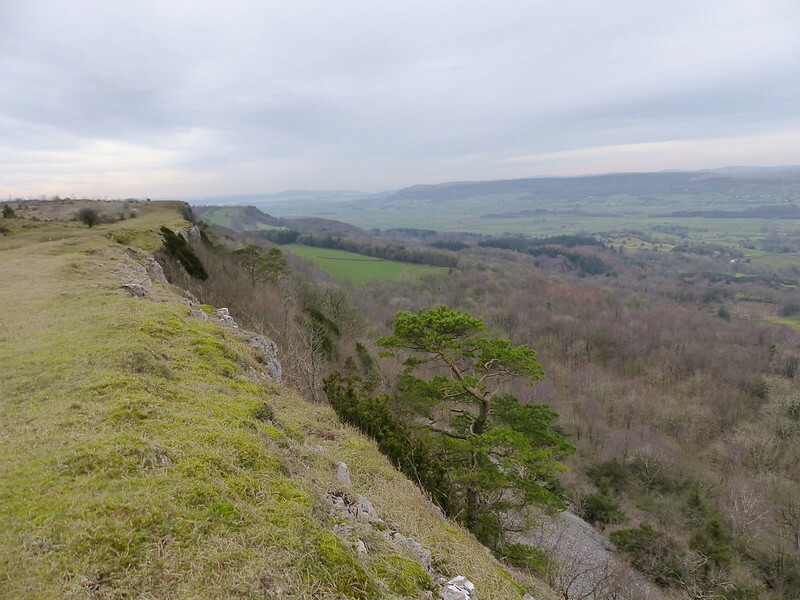 The wide-open nature of Scout Scar really opens up those long vistas, even when the weather is deteriorating and the clouds are drawing in. 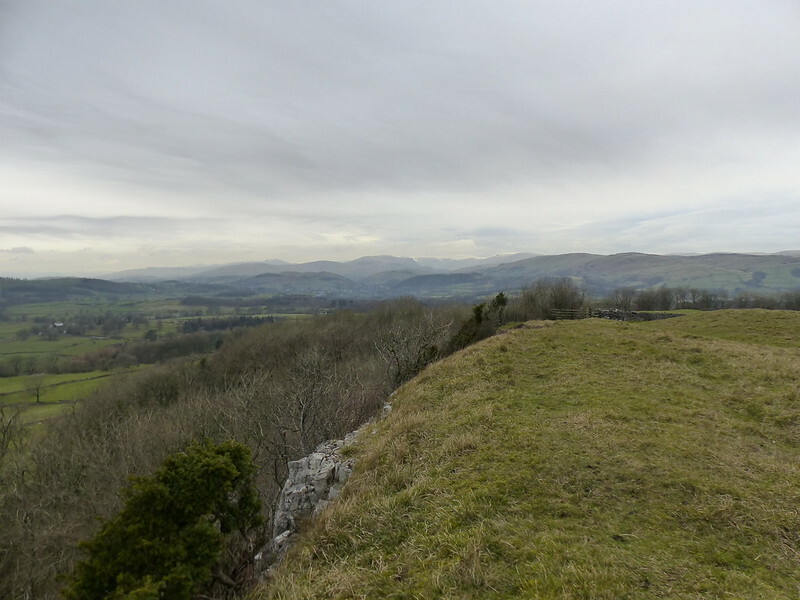 …from the bench on the northern end of Scout Scar where I stopped for a brew and some lunch, looking back on Cunswick Scar, which in fact is in two sections. 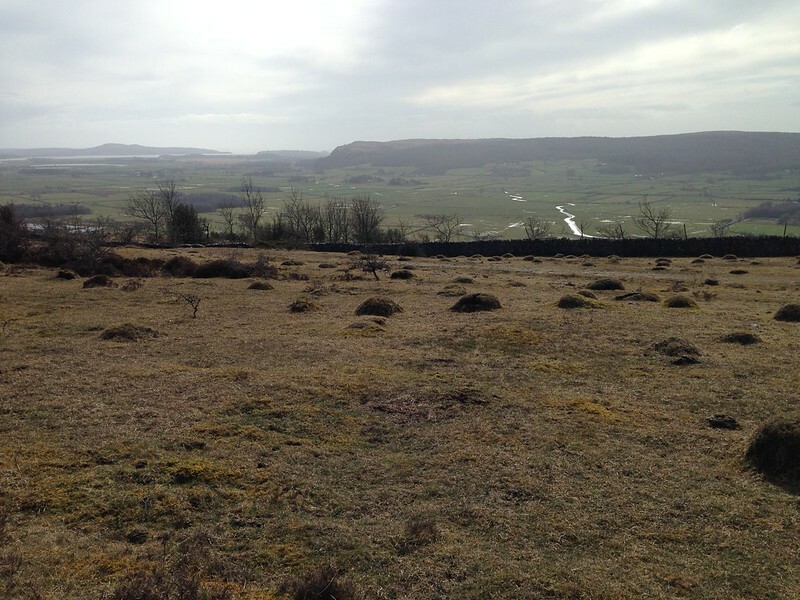 Is a view south along Scout Scar and across the Lyth Valley. 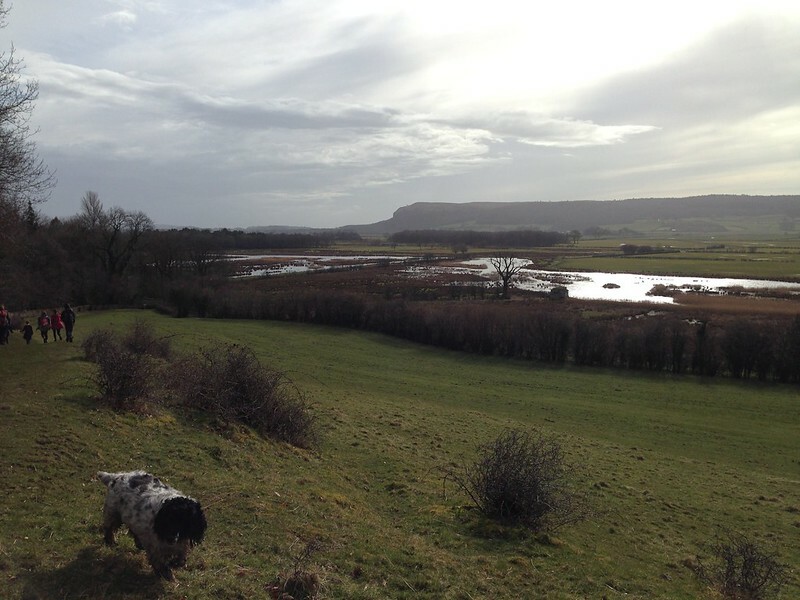 The hill in the distance is Arnside Knott on the far side of the River Kent. 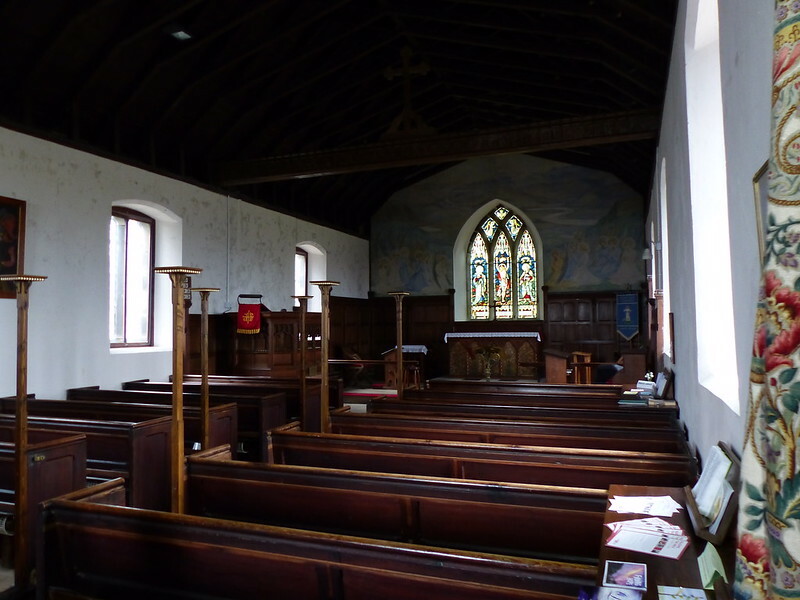 The interior of the tiny St. John’s church Helsington, which sits in a remote spot on the Scout Scar ridge. 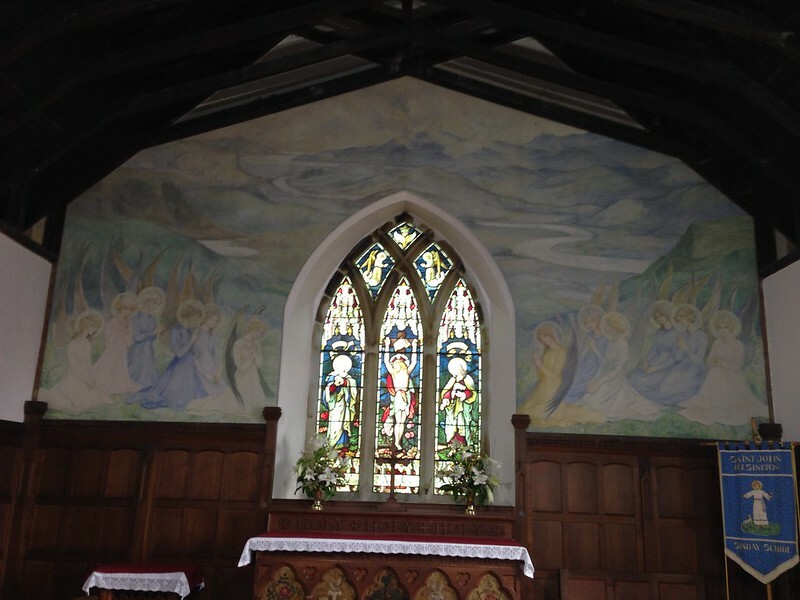 Some details about the church and the mural here. 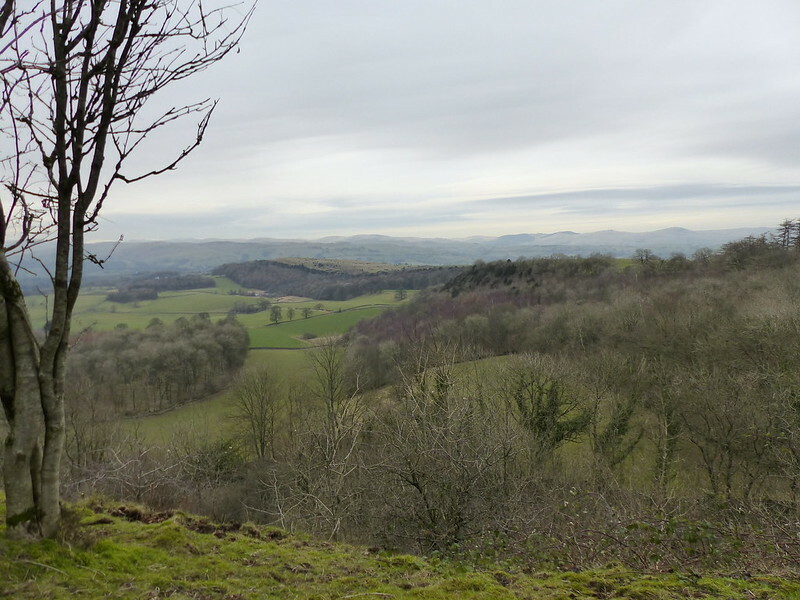 The long walk along the scar, gradually heading down towards the village of Levens was very enjoyable, if increasingly gloomy. Much as I enjoyed it, I don’t seem to have taken anymore photos. The anticipated rain finally arrived as I walked through Levens. I’d originally thought I might get to Milnthorpe or even all the way home, but after the late start and with the light fading and the heavens opening, I decided that discretion was the better part of valour. I managed to leave TBH a message on her phone. Fortuitously, she was just about to leave Staveley when she got the message and arrived to pick me up from a layby near Levens Bridge on the Kent only moments after I arrived there myself. Nice to be the beneficiary of a personal taxi service for a change! I really enjoyed the walk, in fact I’m still enjoying it in retrospect, and really must engineer some more opportunities to walk A to B, or better yet, A to B, B to C, C to D etc over several days…Now there’s a thought!